The stick has been added to the National Toy Hall of Fame. It joins the 2005 inductee, cardboard box as free “toys” that incite a child’s imagination. I have to agree that the stick belongs among the list of 41 toys in the National Toy Hall of Fame. I’ve seen the actual exhibit when it was located in Salem, OR at the A.C. Gilbert House Children’s Museum. When we lived in Salem, the kids and I frequented the play museum along with its famous toys. I always get such a sense of nostalgia while walking through the aisles. This years inductees also included the skate board and baby doll, the actual doll added was the American Girl Bitty Baby. 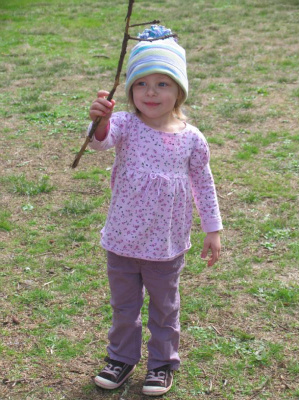 Just this weekend we used sticks to roast marshmallows for our s’mores and played stick ball. I don’t think there is a better toy, except maybe the cardboard box which becomes a cave, a doll house, or a sled. Oh, leaves that reminds me. They are awesome as well. Remember leave rubbings? The kids and I are doing them this fall to make Thank You notes, etc… Fun! We have had great fun with FREE toys such as sticks, acorns, leaves and so on. One of our favourites is obviously Pooh Sticks over the bridge near our house – great fun for us all and no costs involved! I have been searching for a baby doll that is phthalate free, PVC free, yet has a plastic looking face, with organic body. I found the keptin-jr doll. However, it was very fragrant when it arrived. I am not sure what the face is made of. Does anyone know about this keptin-jr. doll? ALso, does anyone have a suggestion? I like the joy waldorf dolls, the earth baby doll-jayden, and the under the nile-janie doll. However, my daughter has made it clear she would like a baby doll with a baby looking face. The last concern is price: Is there a doll that is not in the 85-165 price range? While the plastic the Keptin dolls are made from contain no phthalates, they are PVC (which is bad in itself), and the fragrance itself may contain phthalates. I have yet to find anything that really fits the bill, unfortunately.